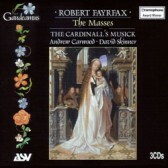 This four disc set represents the complete Masses by Robert Fayrfax as recorded by The Cardinall’s Musick on the five previous discs in the series. It represents a considerable collection and great value for money especially since it contains a piece recently attributed to Fayrfax. Thanks to the excellent work of Dr David Skinner, the elevation motet Anima Christi has now been firmly ascribed to the Englishman and proved to be a companion piece to the Missa O bone Jesu. This track is not available on any other CD and the booklet not only explains the research involved but also carries a copy of the music.